Brass Magnetic Flow Switch - Misensor Tech (Shanghai) Co.,Ltd. The DN series are made of brass material ,there are baffle and piston two types .As the structural constraint ,they can be mounted vertical . If there is liquid's flow rated 3L/min , the baffle will open to keep the circuit on or off . 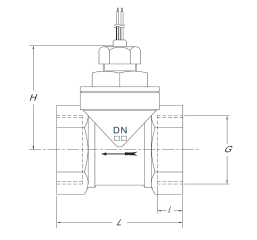 According to customers' requirements, there are many size connectors can define .Such as 1/2BSP, 3/4BSP,1BSP and so on .